So I'm working on an online class. It's supposed to be for scrapbooking, however, since I'm totally digging the art journals right now, that's what i'm doing. 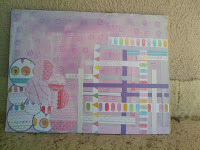 I'm making an art journal for Baby Bela - my daughter. The online class is with Shimelle. This project/album/journal is to use up all the scraps and excess stuff we scrapboookers have and tend to keep for a while. I dug through my stash and found some really cool stuff!! I have done 4 pages so far. The second prompt I opted to use patterned paper to make my page. Came out cute. 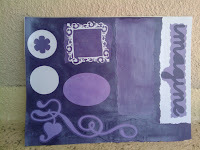 I used a cardstock that had cute candies and make the background pink/purple with acrylics. I added a stamped swirly also. can't wait to write in it!!! The 3rd prompt was for the use of ribbons. 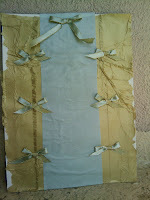 I had some left over ribbon from christmas and some left over gold tissue paper. 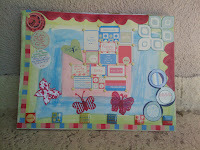 I added a writing area in the middle with vellum - please note you need special markers to write on vellum. The 4th prompt i chose to do a tone on tone page. I chose purple because i love that color! and pink together...but i already did a pink/purple. I love how many open areas there are to write in. I used only cardstock for this prompt. The next prompt is for page protectors which is something i don't really have so i'll have to think of something else. These are pretty, I love the 2nd one! !